Morning mist in Beaumes-de-Venise looking toward Ventoux. It constantly amazes me how quickly two months pass. It seems in the dead of winter each month is dreadfully long and feels interminable. In contrast, the summer functions the complete opposite. It is never long enough and ends too quickly. These two months in Provence are always racing by even though I try to notice and be present for each moment. On my last day, I was taking in the view while I was out for a cycle. While in Provence, it seems so normal to see such beautiful sights every day, they are present wherever you go. So I was trying to hold on to the moment, knowing within a few short hours it would only be a memory. These are grand memories, but my heart wishes I could be in this place always. I truly feel so much healthier in my heart, body and mind. It is the right place for me. In spite of this, I am grateful for every minute I’ve been able to be here. As the years have passed, I can say my friendships have blossomed and I feel so lucky to know the people I do. They have not only introduced me to even more people but have constantly made me feel at home. I am lucky to have met a couple from New Zealand years ago who so kindly store my bike and goodies all winter long. 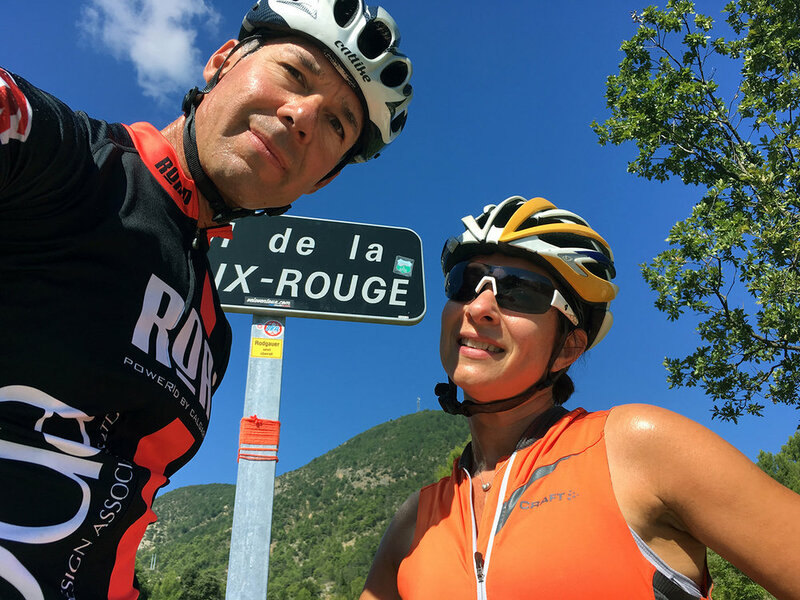 K1 and K2 are fellow cyclists and have a zest for life and Provence. I have learned so much from them. Of course, there is Henri & Jean-Francois at Clos de Caveau. I have been living at “Chez Paula” for a decade now. I have watched Henri’s kids grow into amazing adults and shared so many meals together, they feel like family. Every year I am welcomed with such warmth, it brings me to tears to leave. They have introduced me to so many people, many who have become very dear friends like Tracy and Chuck whose company I never get enough of. 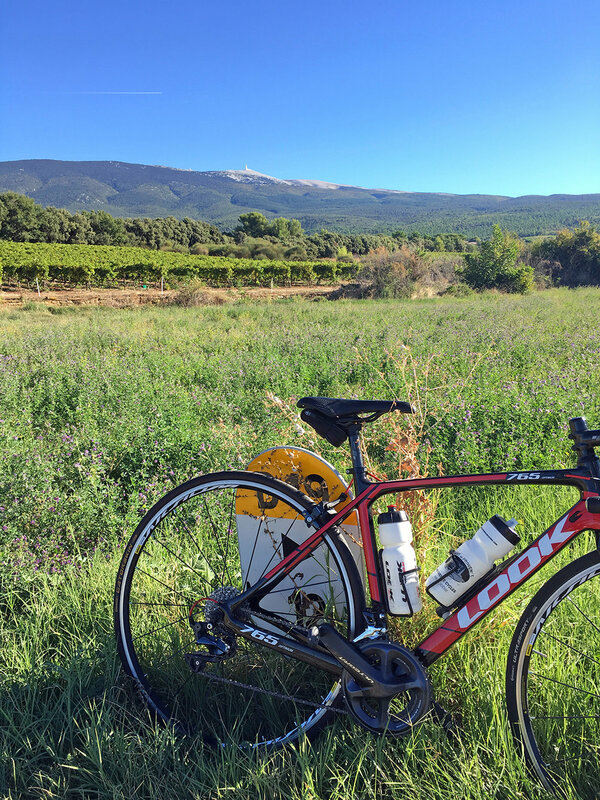 And this year I was introduced to a whole new group of winemakers in the Ventoux. We are working towards a project together and meeting even more people has made me feel I must be here for a reason. They are kind, passionate and wonderful people that I hope to get to know even better over the years. So thank you to all of you. You have included me, introduced me and expanded my life in France. You have made my heart full. It wouldn’t be the same without any of you, and I thank my lucky stars constantly for the crazy luck I’ve had. My heart aches to leave Provence again, and cannot wait to be back again. Bisous. Here it is, the last full weekend of my stint in Provence. The time always whips by and it’s hard to believe I’ve been here just over two months already. This stretch is often punctuated with a wide range of emotions, and this year has been no different. We've been so lucky to have had one of the best Septembers I can remember. With 12 days of over 30 degrees and the rest in the very high twenties, no rain and endless sunshine, it’s been brilliant. As a result, I’ve been on my bike as much as humanly possible. 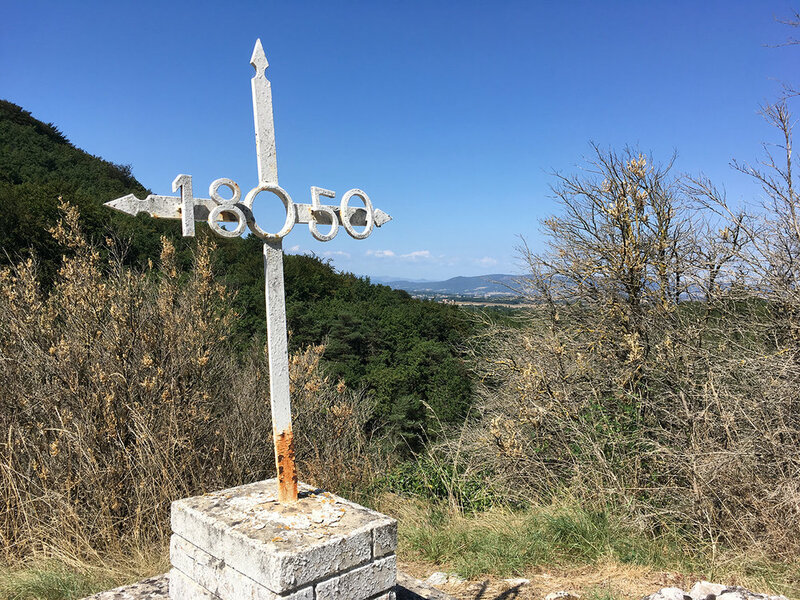 Last weekend I was lucky enough to spend a day with friends cycling in the Drôme. The weather was hot and sunny and the views and route lovely. Afterward, we sat on a charming village terrace in the sunshine drinking pressions, then carried on to cooking dinner for even more friends. It was one of the best days I’ve had, as schedules rarely work out to allow us a full day together. On days like this, leaving feels like a heart-wrenching exercise, one I wish I didn’t have to do. October entered with a severe Mistral, and temperatures dropped for a few days. They swung back up for a few more glorious days but now, the rain is arriving. This is when things feel a bit different here. When the sun is shining, the magic of this place is hard to ignore. When it’s cool and cloudy, you see the reality of it. This season is always very quiet and slow. It’s actually beautiful in its own way, and you really get a sense the true nature of Provence is revealing itself to you. There is something enchanting about it, but also a bit sad. The days are so much shorter and cooler, the towns are emptied of tourists, the roads are so quiet you might not see another soul. This leaves me with mixed feelings; it’s calm and peaceful, but I also feel melancholy. I miss having Jason here to share in the beauty of this place, and I miss the long days. I suppose the melancholy is not only for the change in the season but for knowing my stay in Provence is ending. One thing I know for certain, having only a short time here helps me appreciate it so much more. I feel eternally grateful for being able to make this work. As I was reminded, I never know when I might not be able to come back. That would be an unbearable thing, so I truly hope it doesn’t happen anytime in the near future. Gluten has been getting a bad rap for a while now. It’s really not fair, as all gluten is not created equally. And some people who think they might have an aversion to gluten are often having issues with the highly processed variety, are perhaps having too much of it, or even have an issue with yeast, not gluten. Now I am not talking about Celiac, I know people with this and it’s a serious issue. And I’m not here to convince anyone about anything in particular. I just want to talk about bread. Excellent bread. As many of you know, the baguette is as much part of French daily life as cheese, wine and small dogs. But not all baguettes are good. I have looked high and low, done my research, tried hundreds of versions from different boulangeries. And I have concluded I don’t like most of them. That’s correct, you heard me right. Over the years my taste for fluffy white bread has diminished. My family was never eaters of Wonderbread or anything like that. We always had some nourishing rye hanging around and to this day, I still prefer it. So here I’ve had to search out chewy, toothsome bread and it’s not been easy. The French still love their classic baguette. It’s always so shocking to see them leaving with five or six at a time. I wonder who on earth could eat that much? But they love it. It’s got a nice crust, not too hard and a soft centre. It’s fine, but it’s not my cup of tea. After many failed attempts I finally have a few go-to places that make some of the best bread and baguette I have ever had. Unfortunately, none are close, so I don’t get to enjoy it on a regular basis. My absolute favourite is La Main à la Pâte in Crestet. These guys are the real deal. Their bread is hearty, creative and delicious. Everything has a tooth. Their baguette is my absolute favourite; chewy with a perfect crust, not so hard you scrape the roof of your mouth. They make an amazing variety of boules from standard to petit épeautre to ones with nuts and seeds. They also make gros pain, a really large loaf which you can purchase a piece of. It’s an excellent way to buy bread. Sometimes you just want a little bit and a whole loaf is too much. The French have you covered. The other honourable mentions go to the best walnut bread made by the monks at the monastery in Le Barroux. This little shop has a brilliant selection of food items made by monasteries around France from olive oil to paté to beer. And they bake their own bread. A word of caution, their hours of operation are a bit random, they work around their church services. And they don’t make all types of bread each day. They used to make walnut bread on Wednesday, but I can’t guarantee it anymore. If you are lucky, you’ll be able to try some. If not, all their bread is quite delicious. And a final mention to Jouvaud in Carpentras. This is one of the prettiest pâtisseries around. A perfect spot to stop and have a coffee and a treat. They make the most beautiful tarts, both savoury and sweet. I finally tried a savoury one and it was spectacular. They have all the sweet items you can dream of, and for years their baguette was the best in the area. It’s still very good, but my tastes have shifted to less white flour and more wholesome grain. But their fougasse aux olives? Don’t even get me started on how in love with it I am. Gluten, you’re still pretty darn great in my books. The beautiful tarts at Jouvaud. They cut off as much for you as you like. So civilized. Here is it, the first day of autumn and it’s +33 C. Provence has certainly delivered a full summer season, and one might think it will never end. I am certainly hoping so. This has been the sunniest, warmest and most amazing September I can recall. It’s normally a lovely month with lots of heat throughout. But not usually with this consistency and typically there is some rain. This year it’s bone dry, no precipitation in the forecast until well into October. I know this doesn’t bode well for the state of climate change, but I can’t help wish it was toujours l’été. It’s been a hectic week since Jason left, and it feels like he’s been gone ages. I wish every day he was still here to enjoy it with me, but it’s also a time for me to hunker down and get some things done. This year I’ve met a whole new group of winemakers and I am trying to get around to see them all, get some projects off the ground and learn as much as I can from them. It’s exciting and fun, but it does take time. As does my work, visiting friends and getting a bike ride every day. So, the time is rushing by without hesitation, and it’s impossible to make these last weeks stretch any further. Still able to enjoy the pool, how delightful. This past week my lovely friend Didi came all the way from Chambéry to see me with a trunk full of treats from the Savoie. 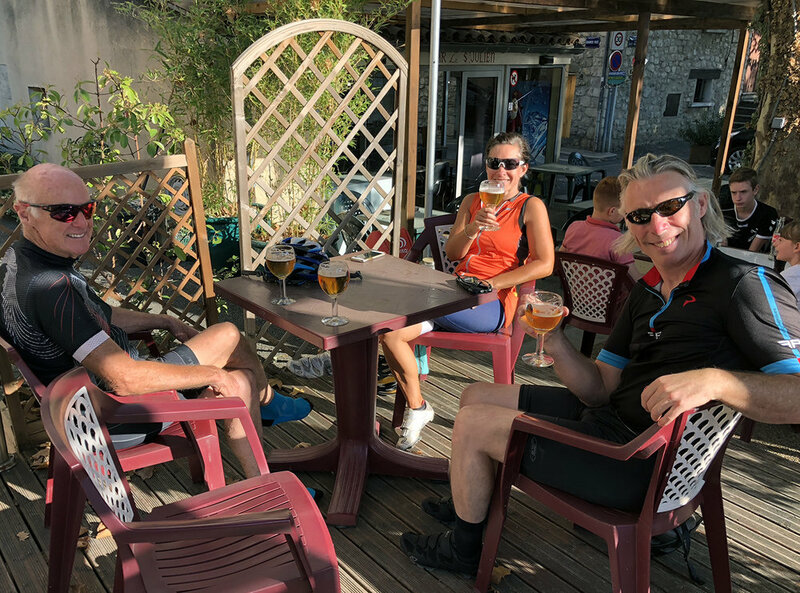 The weather was spectacular, and I had planned to take her on a beautiful bike ride with a stop for a drink in one of the most picturesque villages around here. But as things go, this is not what happened. Earlier on the day she was arriving, I was out for a cycle when 20 kilometres from home I broke my shift lever. I had one, very difficult gear to ride home with, and a lot of hills to climb. It was hot, and it felt like my legs might explode. When I arrived home, I found the part online and while waiting for it to arrive, I decided to rent a bike for a few days. When we picked the bike up I assumed I could lower the seat to the correct height when I got it home. After putting on my pedals and getting ready to go, I went to adjust the seat, but it wouldn’t lower. There was something stopping the seat post from going any further down. Exhausting our options with nothing else to do, I rode it back to the shop barely able to reach the pedals for six kilometres. Didi came along, and when we arrived, the owner was less than helpful. He is truly an unpleasant person; he looked at us as though we were annoying him and said there was nothing he could do. Tant pis. Here we were six km from home in bike shoes, two people and one bike. Didi immediately said for me to take her bike and she’d start walking back. She had regular shoes and I awkwardly rode her awesome electric bike with the wrong shoes. It was a gong show, and not how we imagined our day together. 2018 has been like this for so many of my close friends. It’s been an ongoing struggle peppered with occasional good moments. While I am desperate to hold on to my time here in this summery place, I will also truly welcome the end of this year with the hope things will improve next year. The moral of the story? Even if it seems like paradise and the weather brilliant, life is never perfect, so make sure to recognize and appreciate the amazing bits every time they arrive. My rental: went to a shop in Bédoin where everyone is so much nicer so I could take advantage of this amazing first day of Autumn. Did a big, very hard loop, but what a perfect day for it! I can’t believe we are already half-way through September. I’ve heard people say time seems to go faster the older you get. I do remember the time being very slow as a child, but for most of my life, I’ve always felt that when things are good, time seems too fast and you can’t hold on to the moment. When times are bad, or the weather horrific, it drags on and on. So, I suppose time only flies when you are truly enjoying life. And we’ve really been enjoying these last number of weeks while Jason was here. We spent a great deal of our time on bikes of course, and we discovered some new routes that were absolutely stunning. We ate tomatoes, peaches and figs until our bellies were full, and had a quick three-day visit to Barcelona. Jay went off to the Alps to meet his friend for more cycling and had a brilliant adventure with perfect weather. We enjoyed the sun, the pool and the beauty of this place together. But sadly, within the blink of an eye, yesterday arrived and he had to leave. This is always such a blue time. And this year I feel extra bad for him; he has to return to what is essentially winter weather. Summer isn’t even officially over, and the weather skipped past fall and went straight to winter in Calgary. I feel terrible for him, as the weather his last week here has been near perfect. Over 30 degrees each day with sunshine and blue skies. It will be a dreadful kick to the spirit. In the sunset light in Gigondas. Inside la Sagrada Família, Barcelona. La Boqueria market, craziness in the middle of Barcelona. I am often surprised to find that we humans are surprised when things don’t go as planned. We are all susceptible to it. We have these ideas in our collective minds of how things should proceed in life. My first week here has gone by in a flash. Perhaps because summer is always like that, or perhaps it was my fuzziness and lack of focus most of the week due to some lingering vertigo. Either way, it went by quickly with dinners and lunches with friends, sunshine, bike rides and excellent food and wine.